Cosmic Muffin – I had an Art History teacher in college who tried very very hard to be PC, and not use the term “God”. (This might sound odd in an Art History teacher, but this was also the guy that would tell us stories he’d heard from “a friend” regarding the practices of peyote ingestion. I often accomplished a lot of pre-Calc homework in these classes.) His overly careful terminology was to say, “God, Allah, Yahweh, the Cosmic Muffin or whatever you want to call it”. As such, when ZenMistressE & I began debating Life, the Universe & Everything, I used the term Cosmic Muffin to refer to The Powers that Be, and it sort of stuck. What kind of muffin is a Cosmic Muffin? ZenMistressE used to insist blueberry, but personally I prefer chocolate chip. nom-nom-nom – the sound small children and monsters make when they eat. No, seriously, listen to a little kid sometime, it sounds just like that. All the Things! 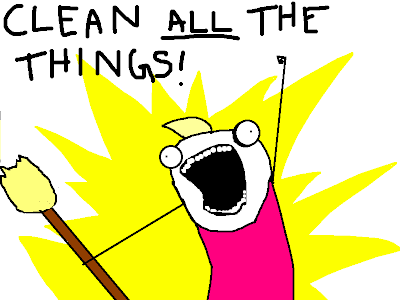 an internet phrase which originated with Allie Brosh over at Hyperbole & a Half in her explanation of This is Why I’ll Never Be an Adult. • Date All the Men! (™best left anonymous). Often a declaration of someone attempting to turn despair over the condition of their life into stalwart resolve to get things in order, a declaration including All the Things! is to be gamely supported by any friend who hears it, even if everyone involved knows it will most likely crash & burn, possibly within a timeframe that can be measured in days hours. Or hours. Oh let’s be honest, we’ll be lucky if it goes ten full minutes. 1049 – my present habitation for the last ten years. Also known as Zoey’s Stronghold of Power. My dog has that neighborhood worked, man. I just can’t even tell you. Museum!Co: presently, my primary contract keeping the puppies in kibble. It’s an art museum in LA which oddly enough, views me as a qualified vendor & pays me to help with it utterly ginormous website. Doll gig: My first (and most beloved) job as a valet was working for a company called Valet of the Dolls, and all-girl valet co. that specializes in private events, which means that we went to a lot of people’s houses. (Yes, in California, people will order valet parking for parties at their house. Yes. Really.) The Dolls do a lot of high end stuff, celebrity parties, etc. Mind you, this does not mean that I spend time hobnobbing with celebrities – it just means that I’ve been to many of their houses and used a lot of their bathrooms. Prem!Co: A 2nd valet co that I used to work for – I picked up up 2 or 3 shifts a week from them for weeknight or Sunday during the day parties. It’s mostly guys, and while the money was welcome & I got to choose my own shifts, I still less-than-three my Dolls better. SpiffV!Hotel. A name riffed off the first hotel that I worked at Spiffy!Hotel, this one is over in Santa Monica on the ocean. I spent many a Friday & Saturday nights there – it was set hours & steady work, and the tips are pretty much… pants. Thankfully, I was able to escape to Museum!Co, where there are admittedly less high-end cars that I’m expected to park, but far better checks to cash.